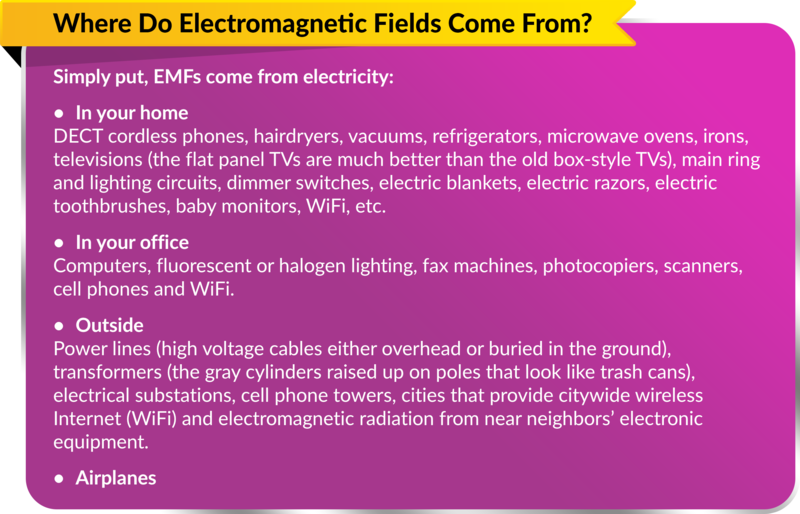 Electromagnetic fields are VERY real. 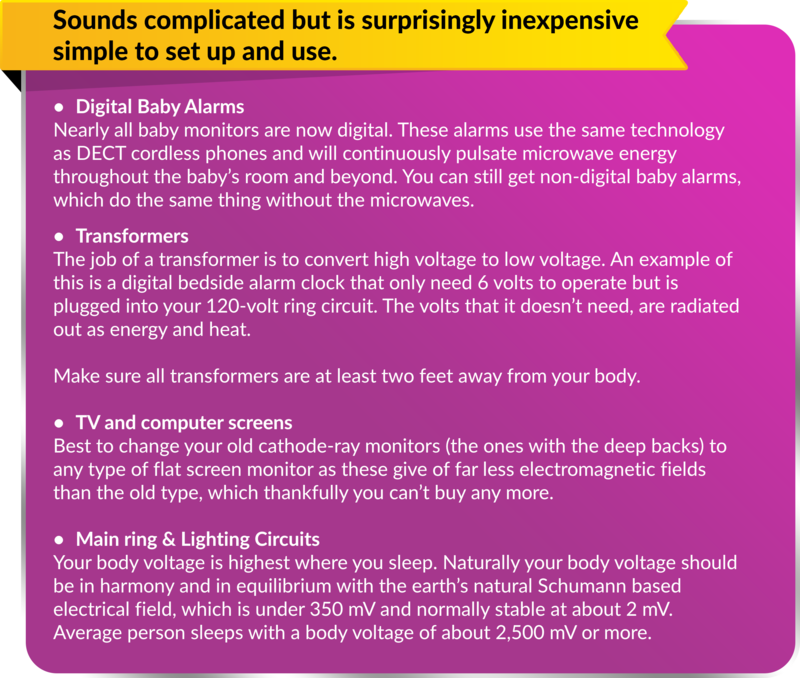 Electromagnetic fields are areas of energy that surround electronic devices. The World Health Organization (WHO) explains that the electric fields are created by differences in voltage and magnetic fields are created when the electric current flows. If you are serious about achieving and maintaining your best health, there are several steps you can take to minimize the effect EMFs have on you and your family. 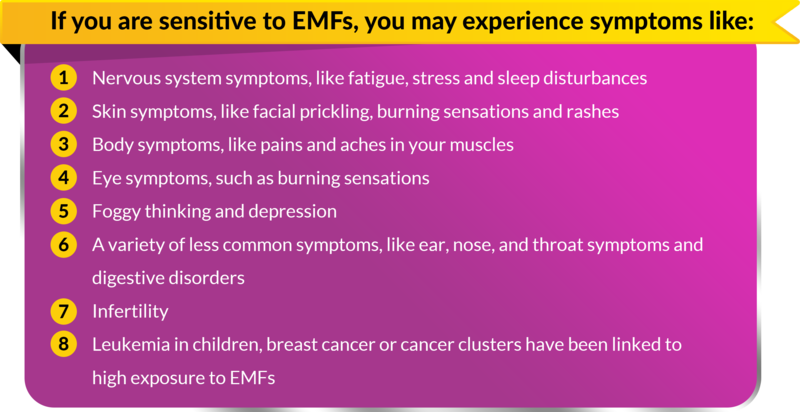 This is especially important if immunity is already low, as EMFs can make it harder for people to recover. On the other hand, if people are well, EMFs may cause annoying symptoms like insomnia or headaches. Here are ways to reduce or eliminate EMF. There is a difference between the earth’s healing electromagnetic fields and the EMFs that produce negative health results. People’s physical exposure to the EMFs can be tested in their home and there are ways to significantly reduce EMFs. When people are outside, their body comes into resonance with the earth’s natural voltage. When they walk into their home, their body is the most conductive thing in the house, which means EMFs are attracted into your body, and your voltage shoots up. We can’t see or hear EMFs but there are testing equipment that calibrates how strong EMFs are. Homes that have proximity to cell phone masts (towers), electricity substations, power lines or transformers can have very high EMFs. Guideline: Look out your bedroom window. If there is a clear and unobstructed view of a cell phone tower facing your way within a distance of about 300 meters, you are advised to look into shielding solutions. If you look out your window but can’t see the masts because they are obstructed by other buildings, then the power density will be mainly absorbed by those buildings and too low to worry about. Use shielding paint on your shared walls or the walls nearest your neighbors. Substations are where electricity is generated, distributed and transformed form high to low or low to high voltage. They may be found outside enclosed in a cabinet, surrounded by a fence or up high on poles. If the substation is immediately next to your home there is little in a practical sense you can do to reduce the magnetic fields. You could purchase an EMF meter called the TriField EX100 Meter that is affordable and available in the US to check out the field levels. Unless the substation is immediately adjacent to your house the EMFs from these small street substations fall to background levels within 15-20 feet. Emit radiation 24 hours a day even when you are not using them. Instead, use ordinary landline phones. Or if you are addicted to cordless phones, you have a couple options. If you live in the US, you may want to look into shielding devices to reduce EMFs from your cell phones, cordless phones and landline speakerphones. Along with DECT phones, WiFi is overwhelmingly the main contributor to household electro pollution with power densities far above any nearby mobile phone mast. You don’t need WiFi in the home, school or office. A far more efficient and environmentally friendly set-up would be to buy a hard-wired router such as a Linksys Cable/DSL Router or Netgear ADLS2 Modem Router with 4 port 10/100 Mbps Switch (DG834) together with a dLan High speed Ethernet Installation. This will enable you to route the internet signal through your house ring circuit enabling you to use as many computers as you want from any room with full internet connection without the WI-FI. Following all the above advice will make an immense difference to you and your families’ health.